This was so much fun to scroll through the years and remember….Thank you, Frank Hardy!!! Thanks again and good luck … I would try EBAY because I have seen yearbooks for sale before in some section. Yep, that’s my “Yug”. We lovingly call him that, because he wrote his name from right to left on the outside wall of our house when he was about 4 years old! I’m sure Jan would appreciate the program. She and I were in that show together. She might have a copy… I do, and I treasure it! Left to right: Jan Jones, Cheryl Gray, Ginger ??? ?, Nancy Mundy. I thought that was you Jan! I have Bill Mann’s 1962 yearbook. You were in it? No Way!! 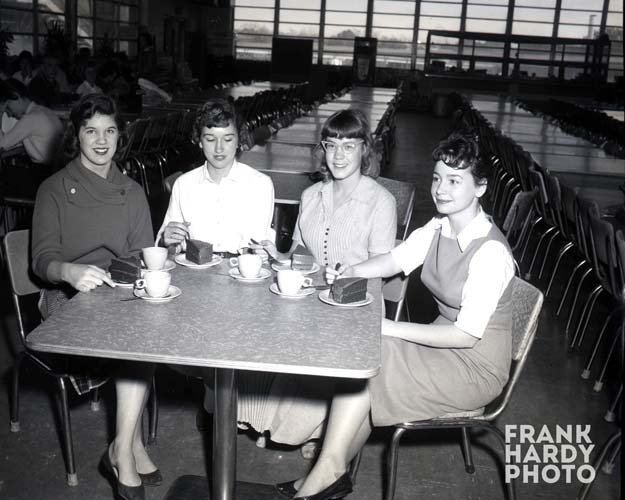 Frank, I cannot identify the young women, but the advertiser has to be Carl’s Bakery on east Gadsden. My wife and I have Annonas from 1954-1958. All five contained full page ads from Carl’s with photographs of students, and four of them used the same set-up, i.e., a group gathered around a table in the cafeteria sampling baked goods. I’d guess that the particular photograph was in an Annona from a bit earlier, e.g., 1952 or 1953. No relation to the principal who was at PHS. My grandfather was Superintendent of the East Hill Post Office station in the strip of stores across from Sacred Heart Hospital near where your father’s shop was. His wife, Louise, was a stalwart at First Methodist Church and I believe a Sunday School class is named for her today. My father also worked for the post office. We lived very near Bayview Park, where my brother and I spent many days swimming. Also, I must correct my earlier speculation about the date of the photograph. Mine was the first sophomore class to enter that PHS in 1954, so the posted photograph must have been the late 1950s or early 1960s. I am enjoying the photographs. Thanks so much for your effort.